What do you understand by the word ‘curation’? 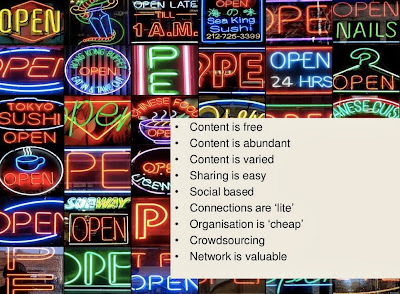 What does it mean in relation to content online? My understanding of curation is embedded in museums – I overheard the curator of the current Superhuman exhibition at the Wellcome Foundation Museum being interviewed by Aleks Krotovski on Tuesday. When I took a picture using my iPad a member of the museum staff politely told me that ‘the curator asked that people did not take pictures’ (and that the curator was in part to blame as he hadn’t wanted the signage saying ‘don’t take pictures’ too prominent) – curator as stage manager and executive producer of a collection of themed objects. The term ‘object’ itself embracing stills, artefacts, video-clips and activities. You curate stuff in a space and set parameters so that an audience of visitors can get their head around what, in effect, has come the curator’s mind. The greatest quality of a Martin Weller lecture is that leaves so much unsaid and unexplained. This isn’t a fault of the lecturer, rather it is either his personality to take an answer so far, to ask questions and then to leave question marks of various shapes and sizes hanging there. Your mission, if you care to take it, is to go and find answers. 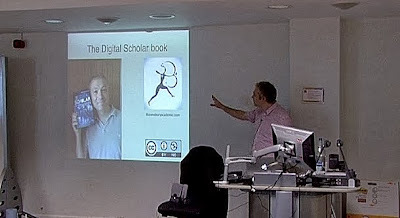 In this talk, or presentation … or seminar (responding to questions afterwards lasts as long as the talk itself) Weller considers what it means to be a digital scholar, and in relation to H818 addresses the benefits and pitfalls of being open. He begins with his book ‘The Digital Scholar’. You can buy it – it’s a book and an eBook. You can also download it for free. Its creative commons copyright also permits you to distribute it, attributed, even to mash it up i.e. to play around with it. I do – often. 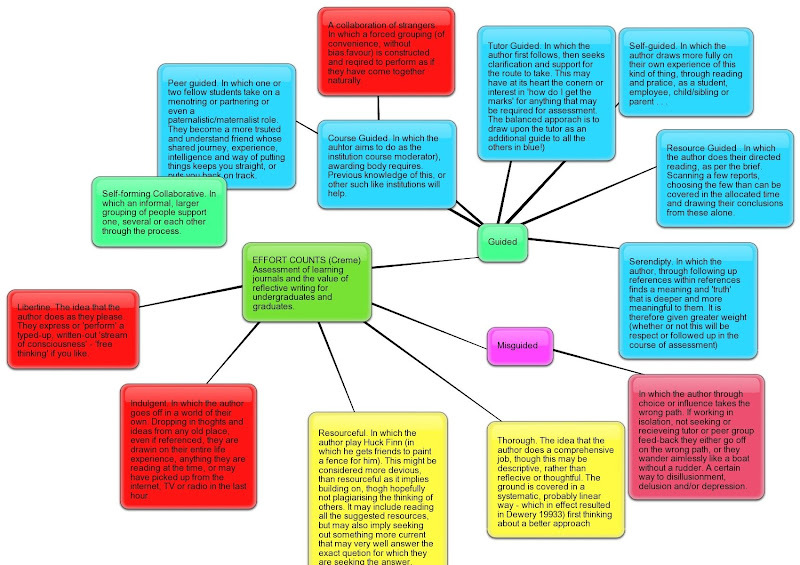 I Tweet it line by line, grab pages and annotate with text and graphics. I try to bring the pages to life, to re-animate the dead. 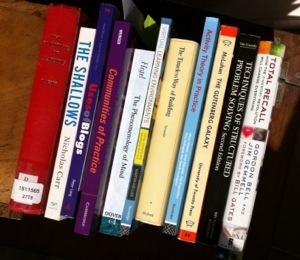 Which is the problem all books have – certainly compared to anyone used to the attraction of interactivity and multimedia and multi-sensory ‘sit forward’ content. Do what works for you in different situations – there are many degrees of openness. The pay-off of presence is engagement, is to gravitate towards and to be a magnet for like-minds. Weller doesn’t say it, but the best thing you can do online is to ask for advice and to know where to do this – in the right forum you will find an expert with the right voice, tone and techniques of explanation just for you. I have been taken by the openness of Amanda Palmer and her philosophy of knowing what she wants and asking for it. 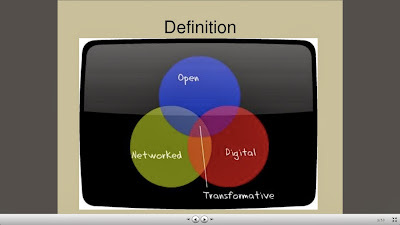 And it is, according to Weller, the intersect between openness, digital and networking were transformation occurs. I’d go further than this and put this Venn diagram in an unexpected context – not ‘out there’, not ‘here’ but rather between regions of your brain. It changes you. Those parts of your that you share, that you are open with, through the quasi-omnipresence of your digital being as it is networked, as connections form – as they do at home, around you with your friends and colleagues, so it creates new and otherwise unlikely tingles of response and activity in your brain. It is neurological. 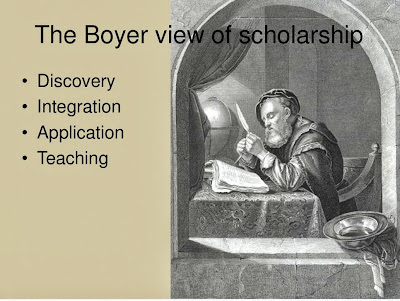 Scholars have been there defining what scholarship is. However much I look at these guidelines and lists, as though they are prerequisites to get into grammar school and take a degree, I think rather of 1901 and possibly still 1911 Census Returns where anyone attending school is defined as a ‘scholar’. The act of being engaged in learning makes you more scholar than anything else – the potential was there even if it was stymied when kids left school armed with the basics at age 14. Wherein lies the problem. Weller says ten years, his peer group gives it longer, for the ‘digital scholar’ to emerge. I have argued that the digital scholar is imminent. I would now say that in time, retrospectively, we will identify people who already are the digital scholars – the 18 year old how schooled law graduated recently called to the bar, the 14 or 15 year old who has drilled through academic research to come up with his own viable solution to a medical issue … the academic community won’t accept it for the very reason that they ONLY see scholarship as it is defined and won through traditional, conservative, tightly controlled levels. 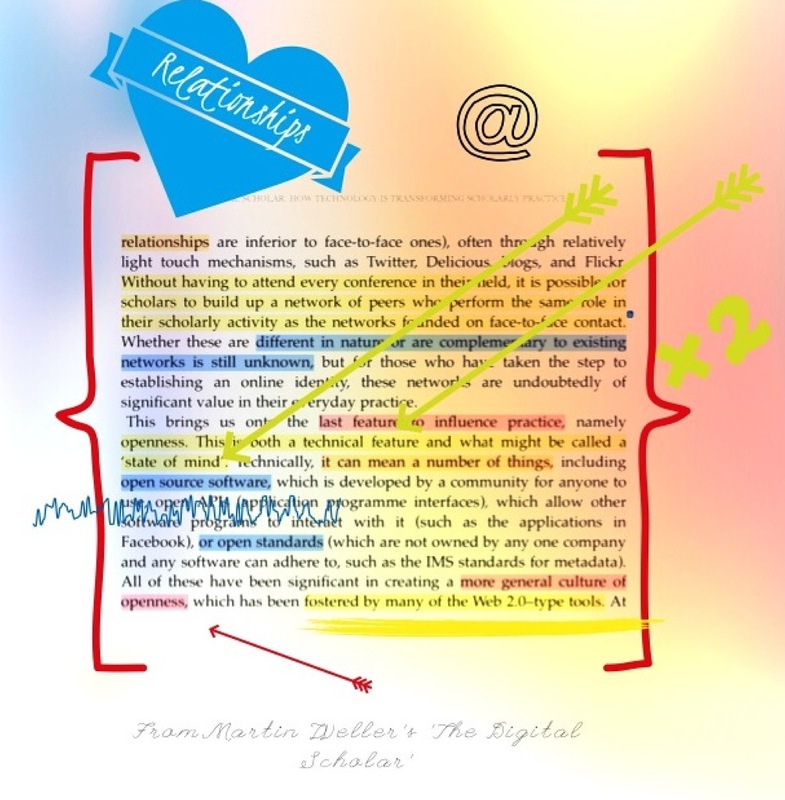 The digital scholar will transcend these … people will simply appear, professor-like in all but name, as a result of the root they have taken into a subject that circumvents the ‘required’ pathway. Gobbledygook it may be … but there are what we would understand to be quite normal conversations that plenty around us may have little understanding of. Those brought up in a digital world have always been familiar with its architecture – it just IS, like houses and trees. Whereas we – most of us anyhow, knew what the landscape looked like before. We have seen the bits and pieces, sometimes do disassembled as to make little sense and we have witness the folly and false starts too and the many white elephants. My niggle with any presentation that quotes somebody is not having the reference. Several hours of searching and I have found only some of the authors quoted and in the case of Waldrop above I can find him, but have no idea where he said it. This matters more to me than ever now, not simply because the level of engagement with the subject that I have reached, but because I expect there to be links and I expect the answer to be a click, and therefore a momentary glance away. I cannot find Le Muir anywhere. 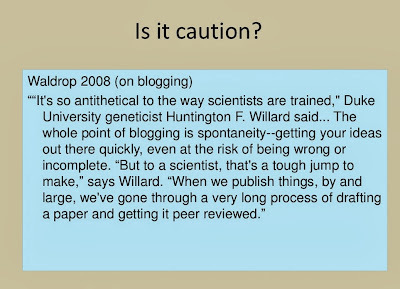 This despite having read more than most on blogging over the last decade. To blog is interesting because the reality is that only a fraction of us take to it … the teenager who kept a diary will make the best blogger, it’s part of you. 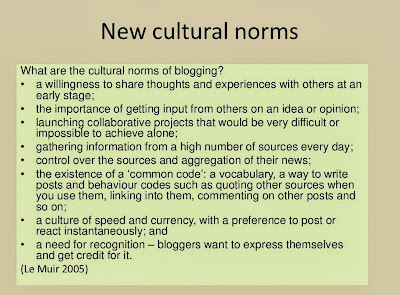 Now the academic community is beginning to expect the 21st century scholar to blog – to have a digital presence, to wear their research on their sleeve, to become like a special edition iPad or iMac, with a see-through skin. We don’t care what you are like, but let us see all the same. 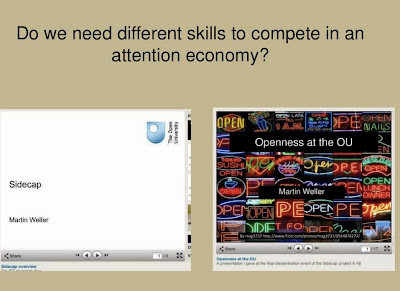 Weller compares before and after slides in relation to the blank with an OU logo and these colourful visualizations. He shows up a failing though. Someone who is good with words may not be able to visualise their thoughts – simply repeating a word in many fonts or creating a Wordle does not in any way complement or enhance the message. Advertisers discovered the answer in the 1960s – you put an art director and copywriter together. How can we get more of that in education? When I see and listen to academics I almost always see a group of strangers who happen to be in the same room. Even or especially in a jointly written paper I don’t see how or where the collaboration has occurred. It’s not as if they are team behind a TV series, each person with a role so clearly defined that it has a title. That’ll be the day. It would require the ‘digital scholar’ to become the equivalent of the producer or director with others taking part having clearly defined roles. As happens, for example, in a product trial. I would also question screen grabs as a way to illustrate anything. I’d far prefer that anyone picks up a pen and does a doodle that expresses what they see in their heads – this after all is closer to the meaning the author is trying to put over. 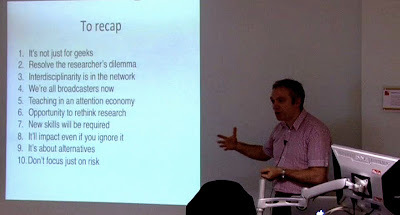 I will return to this moment repeatedly – I admire Weller and those academics who with determination stay on the platform and observe the world as it passes by rather than pandering to the futurologist and revolutionaries who think that we have to sweep away what went before rather than build on it and work alongside it. The first newspapers was printed on the 6th November 1605 – they’ve survived this far. Their savour might be augmented reality. I particularly like the above. I gave a few weeks of my life to writing a scaving book review of Nicholas Carr and ‘The Shallows’ and then supporting my perspective in a thread that emerged in the Amazon reviews. 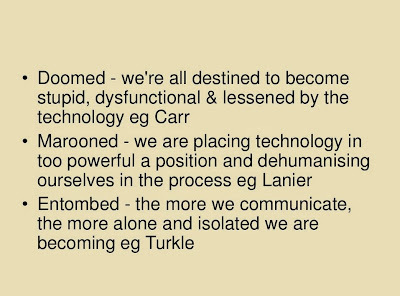 Perhaps I need to go a few rounds with Lanier and Turkle too then accept that a Master’s education means that I will never stand, virgin-like, in front of authors such as these and offer them my body and soul. They are journalists, popularist, scaremongering, plausible and always wrong. 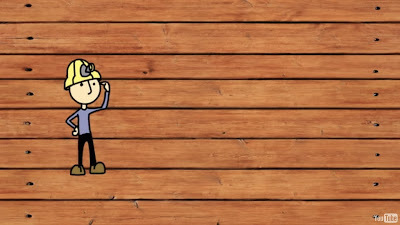 This grab from an animation by David Shriver might be a life-changer – taking me back to a way I did things a couple of decades ago. I just got on with it. Something that is going to work big one day, has to work small first then multiply. I keep itching to start a lecture tour – I have the projector and lecturn. I know what I want to talk about. I need to book a venue and get on with it. What has become self-apparent to me during the course of the last few years studying online education, and ‘education’ is that human beings are extraordinarily diverse. However much we see ourselves as part of a race or community or cohort or class, we are ultimately very alone in our uniqueness. What ever impression you get, say of tens of thousands in North Korea doing drills together in a stadium, they are, each of them, their own person. One of the most wonderous human traits is the contrarian – even against inclination they will do the opposite so as not to be the same. I particularly like the idea that ‘not learning’ should be see as an educational theory. It’s true – keeping your sheet blank while everyone around you takes notes is an approach. Not learning means that you stand still, or go somewhere else while the conveyor belt of the class moves everyone else forward (though in different steps). 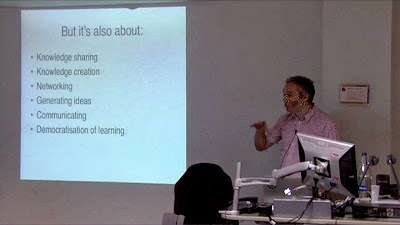 See the 20th March 2012 Lectures at LSE here. Notes attached as a PDF. I’m keen to expand on these notes. To fill in the gaps. To find the precise place where Weller refers to what someone has written. Next step is cutting and pasting this into my external blog. Then spitting it out in bits as and when required. And nailing the references. A couple of clicks and I not only found the reference to John Naughton, but I’d bought his book. 90p on Kindle. Fig. 1. 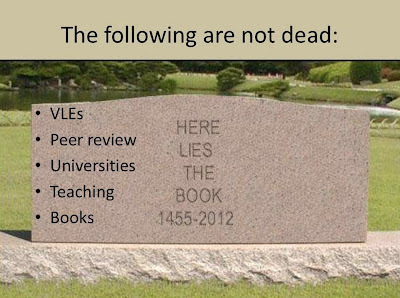 A mashup with a screengrab from Martin Weller’s book ‘The Digital Scholar’. This uses an App called Studio from which I may have been expected or to which I am supposed to provide a link. As I screen grab then crop from the App so that I can ‘publish’ the way like now what? The nature of relationships in a connected world do matter while the difference between face to face and online may be tangential. Whilst I feel I make new acquaintances online, of more interest is how I have been able to pick up very old friendships – even reconnecting with a Frenchman with whom I went on an exchange visit in 1978! I wonder about the 150 connections given as a figure that can be maintained – this depends very much on the person and their role. Even when I collected people for the joy of it as an undergraduate I doubt I could muster more than 70 I felt I knew something about and could care for, whilst my father in law, a well respected, influential and even loved university tutor has, in his eighties several hundred contacts – former students on whom he had an impact as an educator. So, the person and their role will have more to do with this ‘connectedness’, which comes with a price, My father in law saw/sees himself as an educator who put significantly more time than his contemporaries into the students rather than research. I’d like therefore to see ‘digital scholarship’ associated with educators not simply for what they publish – collaboratively or otherwise, but by the ‘quality’ and ‘validity’ of the students they mentor, supervise, inspire and motivate – made all the more possible because of the extraordinary tools we now have at our fingertips. Without the need for smart e-technology – all you require is the imagination of a well informed storyteller to produce a script that is engaging – a journey from which a learner may deviate if something intrigues them, a pattern with a beginning, middle and end that everyone can follow and remember with ease – how else was knowledge passed on before writing? The framework is the logic of the narrative, the logic of the plot, the role-play of the protagonist (you the learner), the battle you have with antagonists (concepts you can’t grasp) supported by your allies (the community of learners, your tutor and institution) leading to a crisis (the ECA or exam), but resolved with a happy ending (one hopes). This is how facts, whether naturally linear or not, need to be presented, if an audience, or a larger part of that audience, are to be suitably engaged by a topic. Some months ago there was a news story concerning how much could be expressed in 40 seconds – BBC Radio 4, Today Programme. Any recollections? Bing Bang was pure narrative, like Genesis in the Bible, with a clear beginning, middle and end. String Theory had a narrative in they way the theory came about, and just about got there. Having spent too considerable a part of my working life trying to write original screenplays and TV dramas I am versed in writing themes and strategies, storytelling in three acts, with turning points and a climax, antagonists and protagonists. I use software like Final Draft and Power Structure. These tools could as easily be used to compose and craft a piece of e-learning. Perhaps I’ll be given the opportunity to do so. Writing a narrative, for a novel or screenplay, is to some degree formulaic. Is design of e-learning as straight-forward? A decade ago it looked complex, five years ago with HTML code package in plug-ins and excellent ‘off-the-shelf’ software coming along the process appeared less out of reach. Today I wonder if it is more matter-of-fact than some make out? Addressing problems, devising a plan (a synopsis, then a treatment), threading it together … maybe its having it operate apart from the tutor or lecturer or teacher is what concerns you (teachers, lectures, profs). You are the ones who must learn to ‘let go of your baby,’ to have an actor or presenter deliver your lines. Once, and well. Or write in a team, as writers on a soap opera. It works to follow the pattern rather than break it. It strikes me that in e-learning design there may be only a few structures to cover most topics – really, there can only be so many ways to tell/teach/help someone understand a concept … or to do something, and remember the facts, the arguments and concepts … to be able to do it, repeatedly, build on this and even develop an idea independently to the next stage or level. From an educational point of view, what do audiences ‘learn’ from these programmes? Try reading the script, try transcribing what is said and look at how far it goes. If only links could be embedded into the programme so that as you view the programme relevant pages from the Internet wold automatically be called up. Do you watch TV with a laptop? Many do. Traders can manage several screens at a time, why not as mere mortals too?It becomes more engaging when you field of vision is nothing but screens, on topic. My preferred way of working is to have two screens, two computers, a mac and a PC, side by side. They do different things, they behave in different ways. I have a team of two, not one. And if its on a commercial channel there are interruptions for adverts, while even the BBC chase ratings. How about the some rich e-learning sponsored by Lucoxade, Andrex or Persil? Bruner, J.S. (1996) Frames for Thinking: Ways of Making Meaning. In: Olson, D. & Torrance, N. (Eds) Modes of Thought: Explorations in Culture and Cognition, 93-105. New York: Cambridge University Press. Egan, K. (1988). Teaching as Storytelling: An Alternative Approach to Teaching and Curriculum in the Elementary School. London, Ontario: Althouse Press. Fisher, W. R. (1987) Human Communication as Narration: Toward a Philosophy of Reason, Value and Action. University of South Carolina Press, Columbia, South Carolina. McCloskey, D. N. (1990) Storytelling in Economics. In Nash, C (Ed.) Narrative in Culture: The Uses of Storytelling in the Sciences, Philosophy, and Literature, 5-22. Routledge, London. Weller, M. (2007) Virtual Learning Environment. using, choosing and developing your VLE. Brown, J. S., Collins, A. and Duguid, P. (1989) Situated Cognition and the Culture of Learning. Educational Researcher, January-February 1989, 32 – 42.